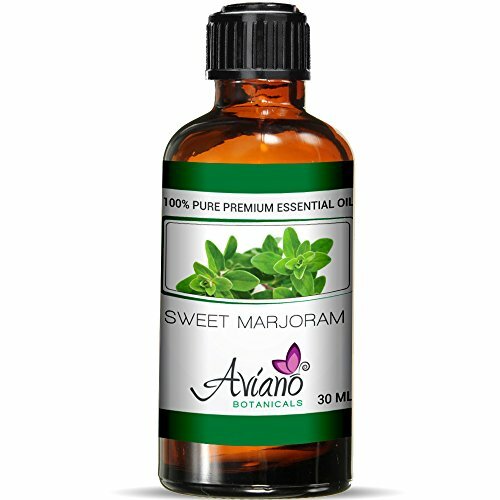 Aviano Botanicals' 100% PURE & ALL NATURAL BLUE DIAMOND THERAPEUTIC GRADE Sweet Marjoram Essential Oil is strong enough to work wonders with only a couple drops, while other brands may need 3x as many drops to reap any benefits. This will insure that our concentrated sweet marjoram essential oil will last much longer than most larger 2 and 4 oz bottles on the market. Comes with our UNIQUE EURO DROPPER allows you to precisely measure drop by drop and avoid accidentally spilling a few extra drops. BEST SCENTED SWEET MARJORAM ESSENTIAL OIL: Our undiluted sweet marjoram oil is 100% PURE hence can be used for aromatherapy in luxurious spas or even at home using a diffuser for a feeling of pure serenity and bliss due to its naturally strong fragrance. No diffuser? Just mix this oil with water in a spray bottle to sense the aromatic scent and feel of organic tranquility. This oil mixes well with frankincense and chamomile essential oils. Since sweet marjoram essential oil is a liquid, you can USE IT FOR MAKING MANY HOMEMADE ITEMS such as perfumes, candles, body wash, bath rock salt, shampoos, hair conditioners, lotions, incense sticks, soaps, air fresheners, and more! Or simply add a couple drops to these(or other) existing items you have laying around to power-pack them with the power and luxurious scent of Aviano Botanicals' Premium Sweet Marjoram Essential Oil. Our SUPER POWERFUL, EXTRA VIRGIN ESSENTIAL OILS uses crops which are always HARVESTED/PICKED AT THE PERFECT TIME to capture and bottle its pure unadulterated essence. Add to Cart Now - We Offer a 100% Money Back Guarantee on All of our Products!